Registration opens soon for the annual Congress of Neighborhoods at Los Angeles City Hall. It’s the year’s biggest event for Neighborhood Councils, bringing leaders from all 97 of LA’s councils together with top City officials for a day of education and networking. This year’s NC Congress happens Saturday, September 9th. Over 40 workshops are offered in four sessions at this year’s Congress, on topics ranging from writing Community Impact Statements that make an impression to NC Funding. Besides board basics, there will also be panels on crucial local issues like homelessness and housing. Your choice of four classes; parking; and both breakfast and lunch are free. Advance registration is required. Space in some workshops is limited, so early signup is strongly encouraged. All board and committee members are welcome at the Congress – in fact, don’t miss it, even if you can only stay part of the day. There’s no need to worry about the Brown Act; your entire board or committee may take the same classes without a violation. 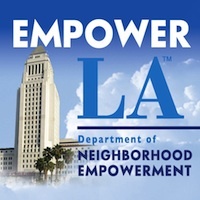 Watch for the registration opening announcement in an upcoming EmpowerLA newsletter, and share it with your Neighborhood Council board and committees. Here’s a web flyer to include in an email to board or committee members. Planning your trip as a group can be very helpful. You can even agendize time to do registration together, and have a discussion of how to best make use of the education opportunities at the Congress as a group. For example, if you’re on a Land Use Committee, you can make sure that at least one committee member is present at each planning or land use-related workshop offered this year. You may even decide to agendize sharing class notes and materials at a future committee or board meeting. This is also a great opportunity to review whether any board member needs to update their required Ethics training. Bring or wear your swag — your Neighborhood Council hat, t-shirt, apron, or water bottles. If your council has it — wear it! You’ll have plenty of great photo opportunities with your gear at the Congress. If you don’t have any yet, you still have time to get some made before September 9th. Check out this week’s Outreach article for ideas and inspiration on branded items for your Neighborhood Council. The Congress of Neighborhoods is committed to being accessible to everyone. Please write us at NCCongress@EmpowerLA.org, if you need special accommodations or translation. This event is put on by and for Neighborhood Councils. Please consider sponsoring the Congress. Your board will be recognized during the event, on the NCCongressLA.com website, and on the NC Congress social media. Click here for more info, including a copy and paste sponsorship item for your agenda. Volunteers are also needed to help set up the day before the event, and on event day. You may sign up for any role you’d like, including greeters or workshop sponsors. Learn more about volunteer opportunities and sign up here. Every year, the NC Congress pays tribute to Neighborhood Council leaders who have recently passed away. Memorials appear in the printed program, on the NC Congress website, and in a special display at the event on September 9th. If you know of a Neighborhood Council leader who has passed during the past 12 months, please submit their name, a photo, and a brief bio (50 words max) to NCCongress@EmpowerLA.org. Submissions should be received by 5 pm on Friday, August 25th, to ensure inclusion in this year’s event.